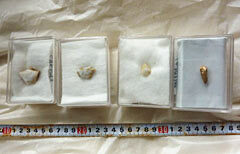 A tooth (right) and some quartz were found in the excavation. The staff of the Okinawa Prefectural Museum & Art Museum held a press conference at the excavation site in Sakitari Cave, Tamagusuku, Nanjo City, on August 4, announcing that they have unearthed three fragments of quartz and one piece of human bone (tooth). 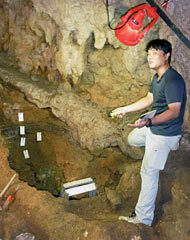 The excavation team, which aims to discover links to the Minatogawa Man, who existed about 18000 years ago, has worked at the Sakitari Cave, in the “Valley of Gangara” next to Okinawa World. The human bone and quartz were discovered between the covering layers of the earth of 4500 years ago and the black layers about 20 centimeters below that, which includes carbon-rich strata estimated by radiocarbon dating to be approximately 19000 years old. Therefore the bone is speculated as being from the period between 4500 and 19000 years ago, but the specific era has not yet been identified. On August 4, at the Gangara Valley, Nanjo City, Shinji Yamasaki, who is responsible for the excavations, explains the work in front of a geological formation dating back 19000 years. Quartz rock is not naturally found in the southern areas of Okinawa’s main island, so it is presumed that it was brought there by human beings. Sakitari Cave is located about one kilometer away from the Minatogawa Fissure archaeological site where the Minatogawa Man was found, and the river, which leads to the site. The team has been working hard on its investigation. The excavation will continue to August 7, and will be open to the public on August 6 and 7. Phone calls requesting information should be directed to Okinawa World Culture Kingdom: 098 949 7421.